David (left) and Ron Leslie, at David’s marriage to Elizabeth Westland in Kirkcaldy, Fife, November 1956. Image: Leslie family archive. With a dash of colour. 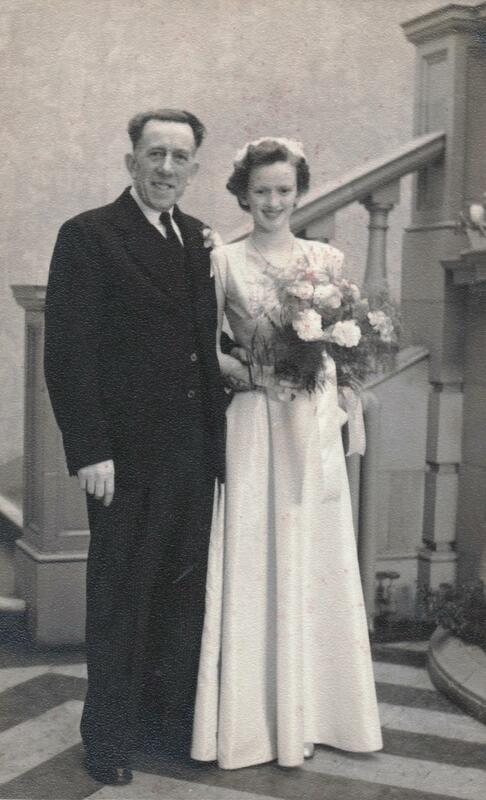 David (left) and Ron Leslie, at David’s marriage to Elizabeth Westland in Kirkcaldy, Fife, November 1956. Image: Leslie family archive. David (left) and Ron Leslie, at David’s wedding to Elizabeth Saunders in Kirkcaldy, Fife, Scotland November 1956. My photographer son had a little time on his hands recently and restored some family photos for me. He’s also experimenting with colouring images, including this of his grandfather and great uncle David. 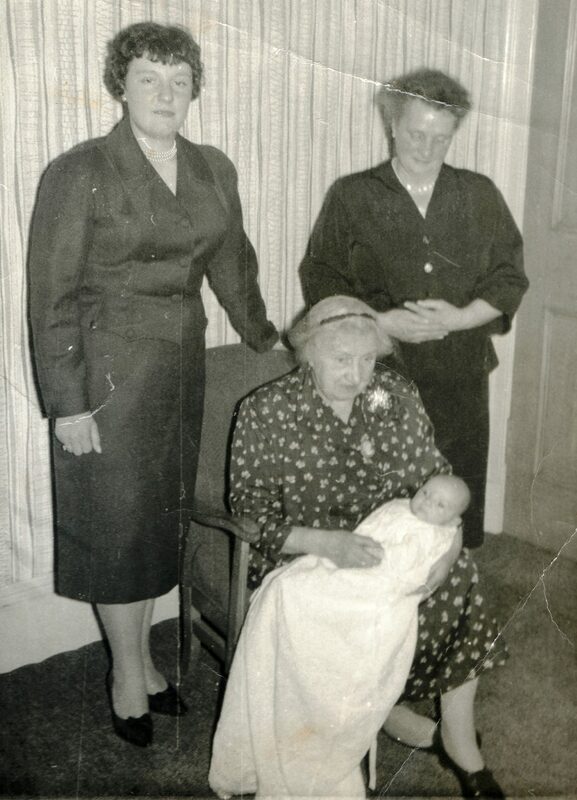 Four generations: My christening, with my mother Elizabeth Ramsay, her mother Margaret Cruden and Margaret’s mother Catherine Black. Image: Leslie family archive. Luanne at The Family Kalamazoo recently wrote two really interesting posts about the deaths of her grandmothers and great grandmothers (1). I wanted to put all my grandmothers together in one post and thought by sharing their deaths it would shed some light on their lives, at least at the end. I also have a ghoulish fascination with looking them over for the variety of ways I might die myself. After all, their deaths could be a form of inheritance. It got me thinking about the women in my family and that part of my own genetic inheritance, so I’ve done the same. And the results have surprised me – not least because I was able to find death records for most of my grandmothers and great grandmothers, but also for all eight of my 2x great grandmothers and 13 of my 16 3x great grandmothers. I only knew one of my grandmothers – my mother’s mum, Margaret Simpson Bisset Cruden. Gran died in on May 1, 2006, 10 days short of her 98th birthday. I can’t lay my hands on her death certificate (embarrassed admission), but my mother thinks it was basically written up as “old age.” I’ve described my gran as a Force of Nature – and I suspect that in the end, she just got tired of an increasingly constrained life after a significant deterioration in her eyesight forced her into residential care. 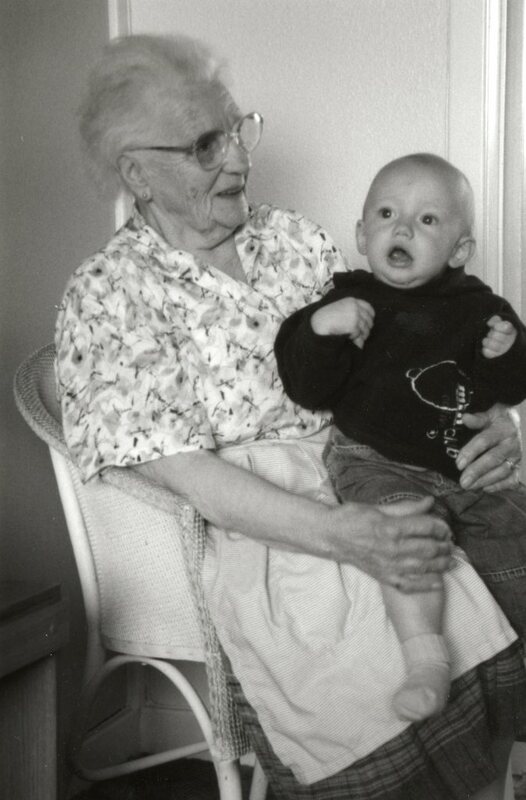 One of the last photos I have of my gran; meeting her 25th great grandchild (my son) for the first and only time. Image: Leslie family archive. By contrast, my paternal grandmother, Susan Forbes Nicholson Elder, died on 11 March, 1950 at the age of 50. The cause of death given in the statutory register was arteriosclerosis and cerebral haemorrhage. I never met the woman I was named after; my dad was only seventeen when his mother died and I know how painful her loss was to him. Susan Forbes Nicholson Elder. Kirkcaldy High Street. circa 1940s. 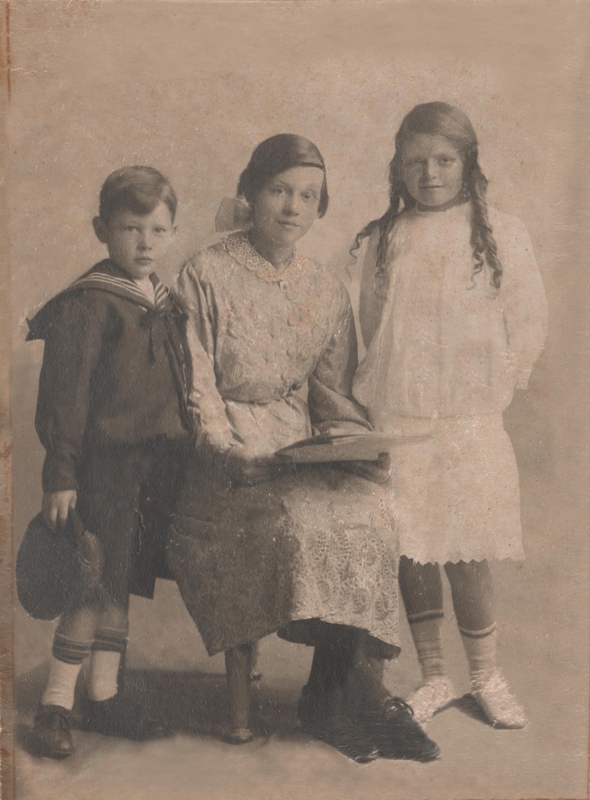 Susan Elder (centre) with siblings Elizabeth and William. c. 1914. Image: Leslie family archive. Catherine Simpson Bisset Black — my maternal grandmother’s mother – died in 1971. Like her daughter (Margaret Cruden above), she lived a long life; being 82 when she passed away a year after her husband of 62 years, Alexander Cruden. I don’t have her death certificate either so am not sure about cause of death. 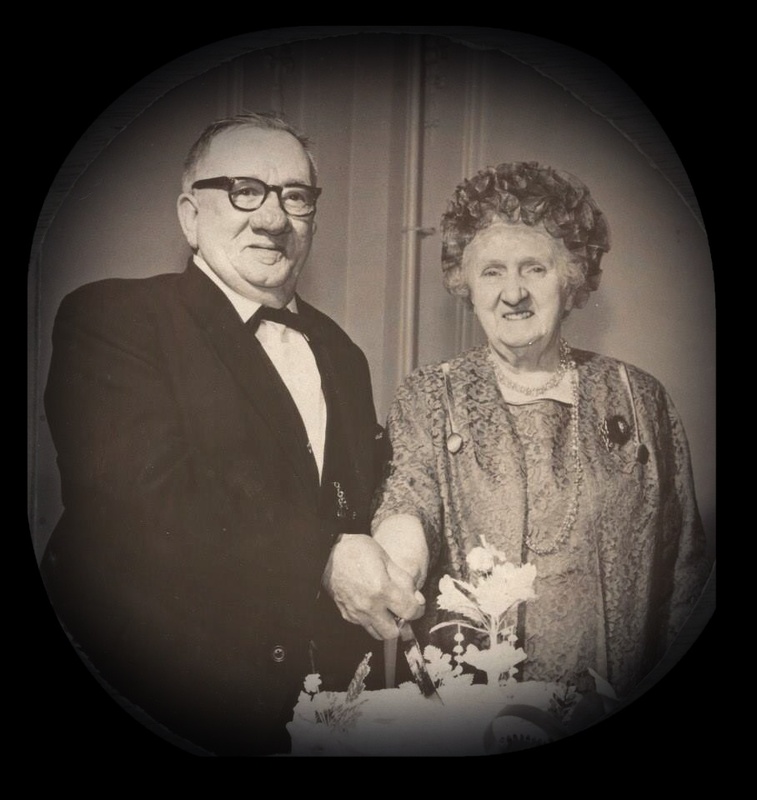 Sixtieth wedding anniversary: Alexander Cruden and Catherine Black, 1968. Photo: Ramsay family archive. 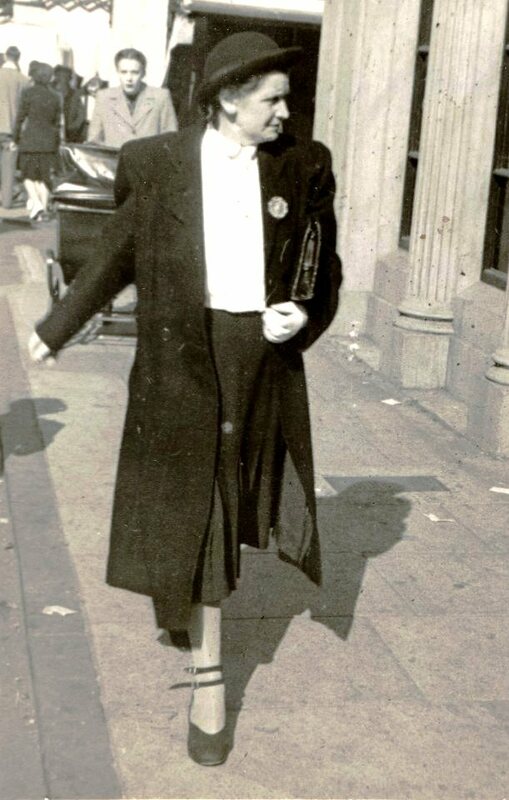 My mother’s other gran, Mary Fisher, died in September 1952 of a carcinoma of the gall bladder. She was 73. 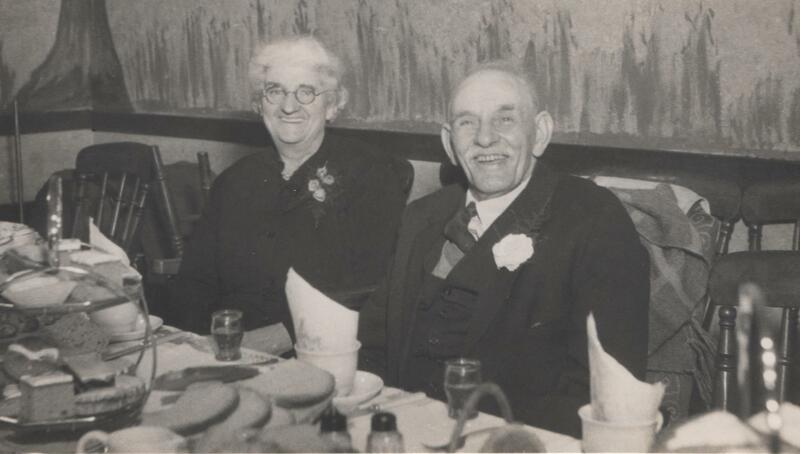 David Skinner Ramsay and Mary Fisher; their fiftieth wedding anniversary. Image: Leslie family archive. Mary Fisher with husband and children c. 1919. Image: Ramsay family archive. On my father’s side of the family, his maternal grandmother — Anne Kinnell Nicholson — died in May 1946, aged 76. Her cause of death was recorded as cardio-vascular degeneration. Ann Kinnell Nicholson c. 1937. Image: Leslie family archive. Dad’s paternal grandmother Isabella Gourlay was 91 when she died in February 1961. The cause of death was recorded as congestive cardiac failure. Margaret Simpson Bisset (19 April 1856- 2 April 1900), died of uterine haemorrhage probably as a result of childbirth, aged 43. Isabella Westwater ( – 7 December 1924), died of chronic bronchitis. The death certificate states she was 71, but I have not been able to find a birth record for her. Susan Forbes (23 August 1839 – 19 April 1912), died of cerebral thrombosis, aged 72. Elizabeth Penman (12 August 1839 – 8 August 1920), aged 80. Cause of death: diabetes. Mary Gerard (c. 1835- 7 May 1907). Her age at death was recorded as 72 and the cause of death as enteritis and haemorrhage. Janet Trail (c. 1835 – 4 March 1913). Her age at death was recorded as 78, and cause of death bronchitis. 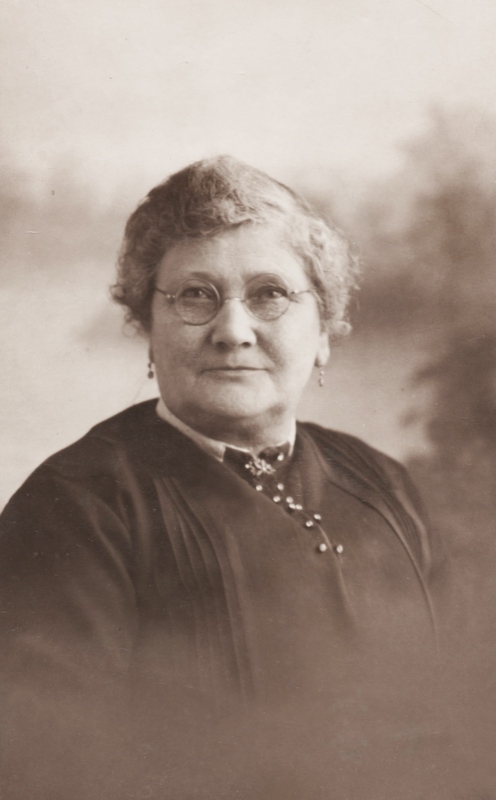 Helen Lang Simpson (14 February 1832 – 25 September 1914), Died aged 82, of arteriosclerosis and senile decay. Caroline Goodall (c. 1833 – 16 May 1901). Her age at death was recorded as 68, and the cause of death carcinoma uterine. Jane Allison (c. 1835 – 2 September 1876). Her age at death was recorded as 41, and cause of death typhoid fever. Mary Webster (c. 1824 – 16 March 1907). Her age at death was recorded as 83. Cause of death: cardiac arrest, senility. Margaret Lindsay (27 May 1827 – 1 January 1906). She died aged 78 of ovarian tumours. Helen Low (5 December 1814 – 7 May 1887). Died aged 72 in the Dysart Combination Poorhouse. Cause of death: paralysis, senile debility. Maggie? (or Isabella?) Westwater. I know nothing about this woman beyond what is recorded on her daughter Isabella’s marriage and death records. When Isabella married John Ramsay in 1875, her mother was named as Isabella Westwater, deceased. 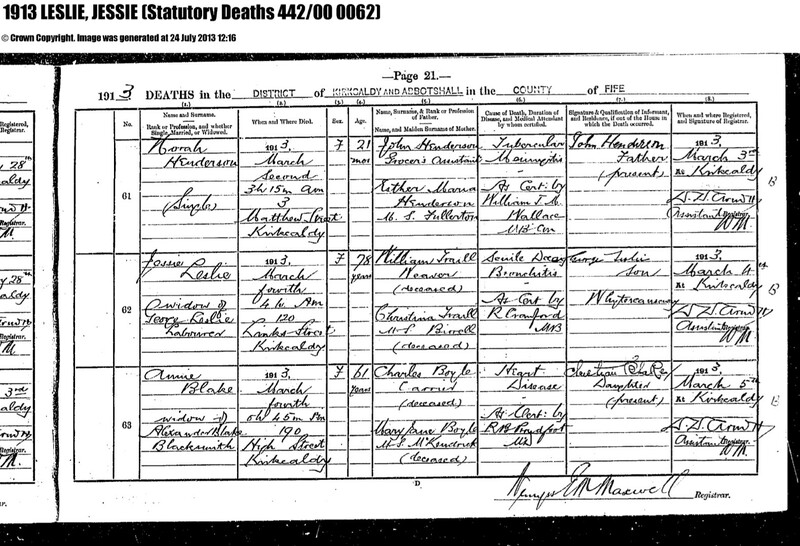 On Isabella’s 1924 death certificate, her mother is named as Maggie Westwater, deceased. Mary Tod (7 June 1803 – 1 February 1883), died aged 79. Her cause of death was recorded as old age. Catharine Cook (c. 1813 – 16 May 1879). Her age at death was recorded as 66, and the cause of death old age. Isabella Lambert (25 March 1804 – 25 December 1851), aged 47. The only record I have relating to her death is an (OPR) Old Parish Register entry relating to her burial. It does not show cause of death. Elizabeth Rankine (c. 1805 – 10 December 1850). The OPR record of her burial shows her age as 45, but gives no cause of death. Christian Birrell. I believe that Janet Trail’s mother was born around 1787, but I can find no record of her baptism, marriage or death. The last census in which she appears is 1851. Elizabeth Robertson gave birth to George Leslie, my 2x great grandfather, in 1822. Besides his baptism records and an entry in the 1841 census, I have been unable to find any records relating to Elizabeth’s life and death. Doing this exercise made me incredibly grateful for excellent Scottish record-keeping – in particular statutory records, which began in 1856. Because of this, I only had to rely on parish records for information on the deaths of two of the 3x great grandmothers about whom I know. Three others remain completely elusive; being little more than names on their children’s birth, death or marriage records. 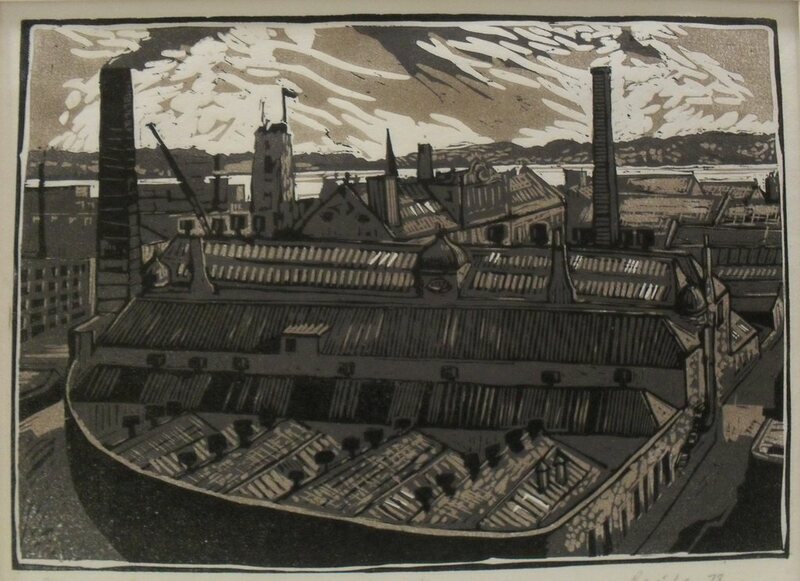 I’ve done quite a lot of work on Elizabeth Robertson and Christian Birrell particularly, but they remain brick walls. When I looked at the age-at-death data, one thing that really struck me was how many of my female ancestors lived very long lives. Two made it into their 90s – one from each side of my family – while five of the 27 I have information about lived into their 80s. Perhaps more surprisingly, four of those five were born in the first half of the 19th century (1812, 1824, 1832 and 1839), a period during which average life expectancy for Scottish women was less than 50 years. Of my grannies who died at or below 50 (six in total), two were born in the first decade of the 19th century, two in the 1830s, one in the 1850s, and one — my paternal grandmother — in 1899. So although I think of them as having died young, in most cases, it would not have seemed so at the time. Within my family the average age at death across the four generations I looked at was 72.5 years, and the median age 73. Causes of death ranged from typhoid fever to “old age” – with the largest number of deaths being attributed to advanced age. The second most frequent cause of death was cancer, followed by heart disease; both major killers these days too. With few exceptions, these women were born into poor, working class, landless families. Where statutory marriage records exist for them, I can see that prior to their marriages they were in employment – as flax weavers, pottery workers, domestic servants. They ran households dependent on the weekly wages (or not) of husbands working as miners, carters, agricultural labourers, factory workers, and tradesmen – and of adolescent and adult offspring following their parents into the same sorts of jobs. Most would have had to move house regularly; some from one tenement to another in the same town, others making the move from Scotland’s rural hinterland to the industrial towns of Dundee and Kirkcaldy. An extraordinary number – twenty out of the twenty seven I have data for — died in Kirkcaldy/Dysart, an area of around 15 square miles. Three died in other Fife towns, one never left rural Blairgowrie in Perthshire and another died “across the Bridge” in Edinburgh infirmary. Only one died outside of Scotland – in Detroit. In many ways, there is nothing extraordinary about my assorted grannies. They lived fairly typical (though long) lives for their time, leaving only faint traces of themselves in written records. But however ordinary, they deserve to be acknowledged and remembered. This post is a very small contribution towards that goal. Many of the women had two (or more) medical conditions listed in cause of death. This is reflected in the frequency column. … another brick in the wall? Descendants of George Leslie, my grandad David Leslie, and my brother Craig. Kirkcaldy, Scotland, c. Mar-Apr 1964. Photo: Leslie family archive. I’ve been working on my surname line for a while but have struck a brick wall at my 2x great grandfather, George Leslie. While I’m confident I have accurately documented George’s adult life – certainly from his marriage in 1857 — information about his parentage and early life is sparse and less certain. 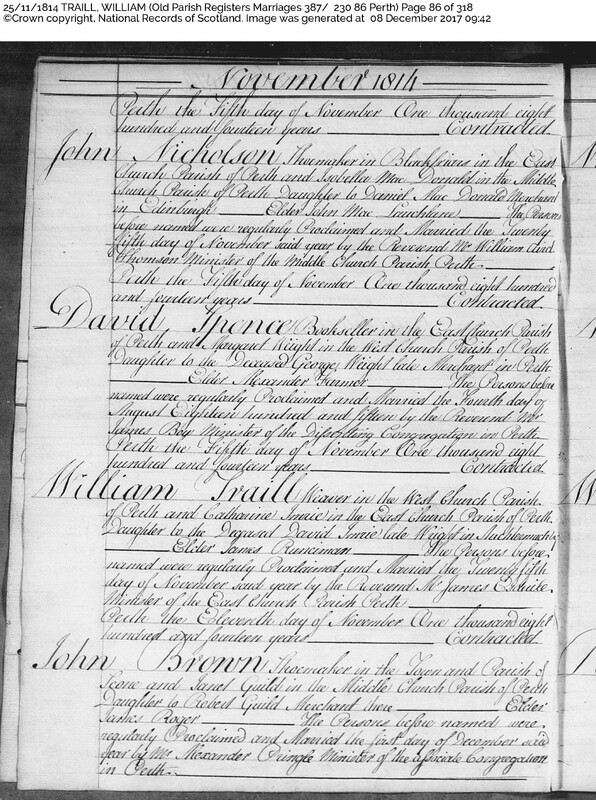 One of the great things about Scotland’s statutory records is that details of parentage are generally included on marriage and death records, as well as (more obviously) those of births. Oh what joy when the information on these sources is present and consistent! Unfortunately, when George died in 1902, his son (also George), reported his grandparents by surname only – both Leslie — and both deceased. The only record I have then which names George’s parents is that of his marriage to my gg grandmother, Janet Traill. They are named as John Leslie and Elizabeth Robertson. John’s occupation is shown as flax dresser, and the record indicates that both parents’ were alive at the time. 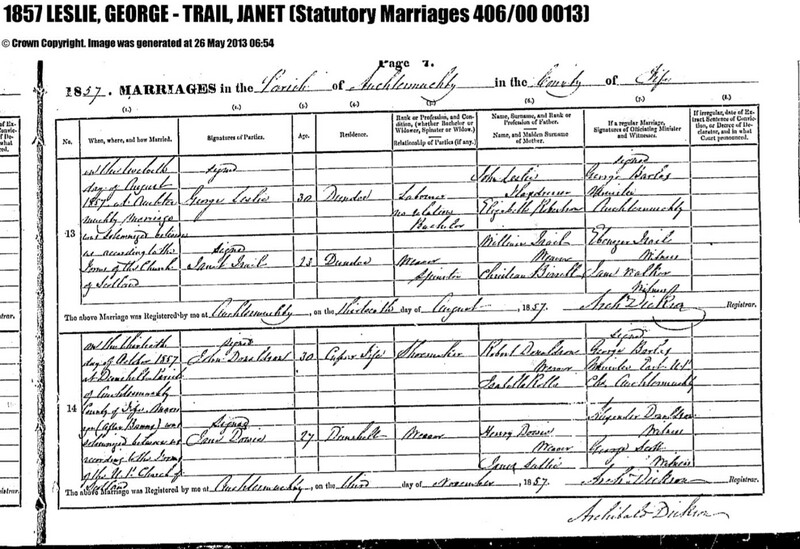 Without corroborating evidence, I had to assume that the names on the marriage record were largely correct in order to search for traces of George’s birth and early life. George’s age at death was shown as 70, which would have made his birth year 1832. However, this is inconsistent with other records, including his marriage and census returns. George’s age may have varied across records, but he consistently reported his place of birth (in census records) as Elgin, in Morayshire. 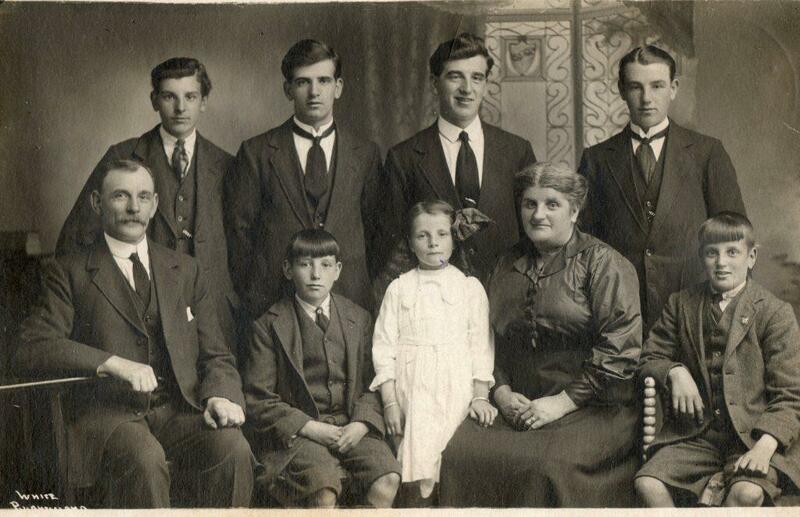 I used both FamilySearch and Scotland’s People; and searched for children named George Leslie (or Robertson) – born between 1810 and 1840 – where the father’s name was John and the mother’s Elizabeth. I allowed for name variations and misspellings with wildcard searching, and in Scotland’s People, searched both OPR (Church of Scotland) records, and those of other churches. Ultimately, three records were returned – two in Morayshire, and one in neighbouring Banffshire. George Leslie born 20 May 1833, baptised 27 May 1833; in Rothes, Morayshire to John Leslie and Elspat Riach in 1833. George Leslie born 3 August 1822 and baptised 31 August 1822, New Spynie, Morayshire; 1822 to John Leslie and Elizabeth Robertson. I’m confident that the Rothes-born George is not my ancestor, for several reasons. While his birth date is not entirely inconsistent with the age given on George Leslie’s death record, it is much later than any of the records created in George’s life-time –which would have been self-reported. While the mother’s first name is a variation of Elizabeth, the surname is different. Though it is conceivable that an error was made on George’s marriage record, one of George and Janet’s children was given Robertson as a middle name, and I can find no other source for that name than George’s assumed mother. Finally and most importantly, census records consistently show this man living in Rothes with his family, when I’m confident my 2x great grandfather was in Angus and Fife. But here is where it gets a bit complicated. I believe that the second and third records actually relate to the same person – and here’s why. The August 4th baptism took place in the Episcopal church of St John at Portsoy in Banff. These records aren’t available through Scotland’s People, and I found this on FamilySearch. 1822 Leslie George natural son to Elizabeth Robertson and John Leslie was born 3rd and baptised 31st August 1822. Witnesses George Stewart and Alex (Alan?) Stewart. As I noted above, my search had quite wide parameters, yet returned only three hits across a 30 year period – and two of those births were in the same week in 1822. The New Spynie register records the child’s date of birth as 3 August. The Portsoy baptism took place on 4 August, which was a Sunday. According to Stewart Brown’s book History of Everyday Life in Scotland 1800 -1900, “baptism was to take place in front of the congregation during a time of regular worship, and as soon as possible after a child’s birth.” (p.126). Before statutory records, the Church of Scotland was the “official” keeper of BDM records. Parishes were also responsible for poor relief (welfare). I have found several instances of children being baptised in the parishes of both parents. I think this was a kind of insurance, so that if poor relief was ever required, the child was “of the parish” and therefore eligible. I think it likely that this child was baptised the second time in New Spynie, in the Church of Scotland, for those reasons. I am though at a loss as to why the kirk at New Spynie was chosen for a second baptism, when the Portsoy extract says that the mother, Betty Robertson, was from Forres — another parish in Morayshire. The parish of New Spynie is about 2 miles from Elgin; the place George consistently reported as his birthplace. If George lived in New Spynie as a child he may have assumed it to be where he was born. 1822 is at the early end of possible birth dates derived from other records of George’s life. However, I’m going to make the entirely unscientific assertion that adults more often shave a few years off their age, than add a few years on. 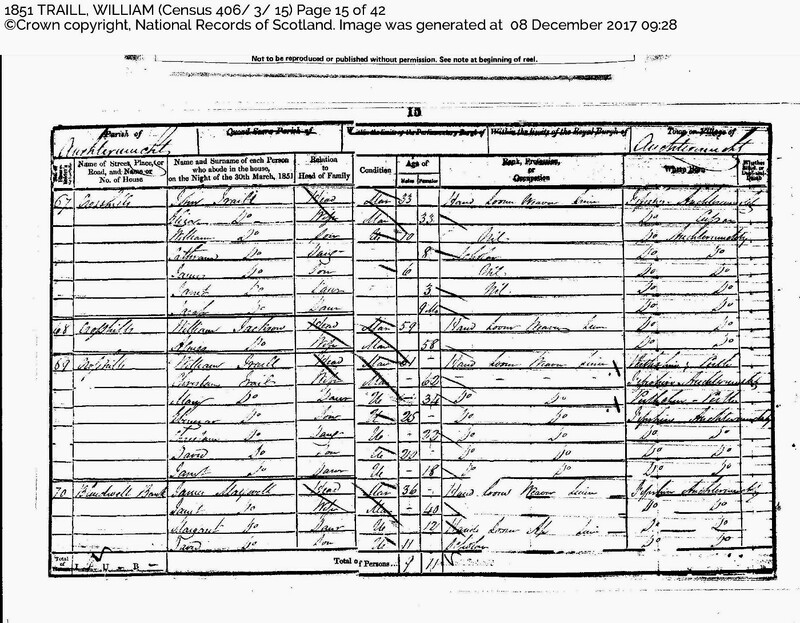 The 1841 census shows Elizabeth Robertson, aged 45 and George Leslie, aged 15, as the occupants of a dwelling at Front Street, Bishopsmill, New Spynie Parish. Elizabeth is recorded as of independent means and having been born in the county (Morayshire). George is shown as an agricultural labourer, born outside the county. As always, I have more questions than answers: why New Spynie? Why the Episcopal church? Was John a member of the congregation? Or perhaps his employer Capt. Cameron was. Who was Capt. Cameron? Was Betty Cameron also a servant of the Captain’s? What happened to John Leslie and Elizabeth Robertson after the birth of their son? I’ve been working on this for a while and am beginning to feel that I wouldn’t recognise resolution if it danced naked in front of me. So I’m turning to you my blogging whanau. Any thoughts on my logic (or lack of)? Suggestions for further research? Pedigree chart, by ancestor place of birth. After reading Amberly’s post (at thegenealogygirl) about creating a pedigree chart based on ancestors’ place of birth, I commented that mine would be pretty monochrome. All of the ancestors I’ve traced were born in Scotland, and even if I broke birthplace down by county, I’d still only have four colours; one each for Fife, Perthshire, Angus and Banffshire. So I’ve gone to village level; back to my 3x great grandparents. And even then twenty four out of the thirty eight ancestors whose birthplaces are known to me were born in what is now Kirkcaldy, Fife. This includes Dysart, Abbotshall, Gallatown, and Kirkcaldy itself — an area of about seven square miles. 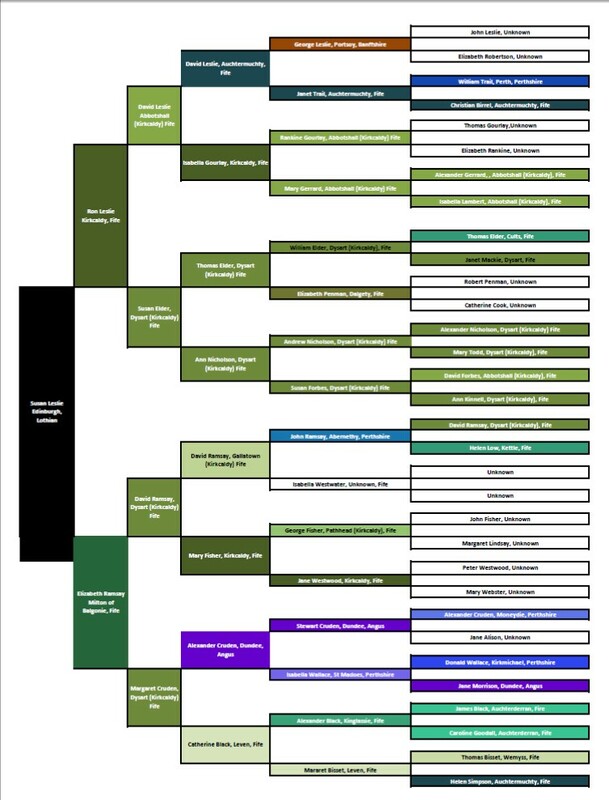 Su Leslie Birthplace Pedigree Chart Template (pdf file, in case anyone is interested). Now I’m off to try and fill in the missing birthplace information. I may have to change my colour scheme though; I’m running out of shades of Fife green. Although I’m fairly sure the photo wasn’t taken at Hogmanay, this time of year always makes me think of my parents and their families. Being Scots, Hogmanay is far more important to them than Christmas, and they used to have huge parties to celebrate the new year. 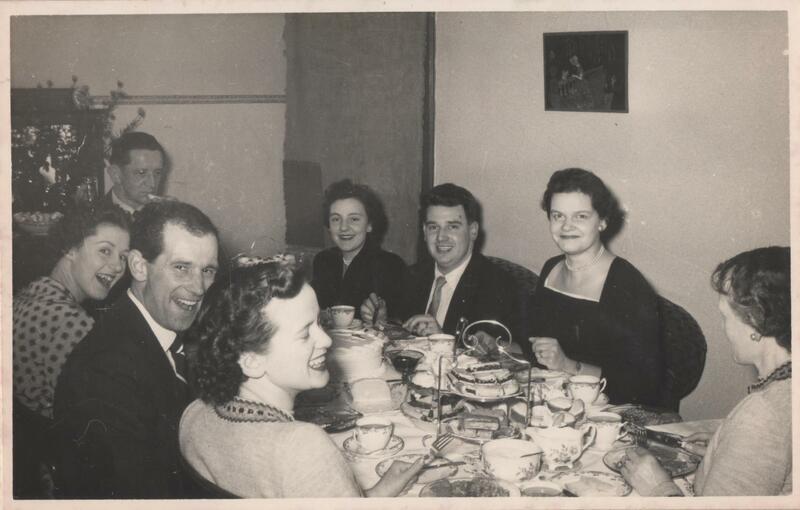 In this photo: from top left my dad’s uncle Bill, my mum and dad, Dad’s cousin’s wife Jean, my great aunt Bessie (barely visible), Dad’s cousin Ann, his brother David and his wife Pat. Kirkcaldy, Scotland, c. late 1950s.